In addition to the button that allows the removal of diagnostic data collected as part of the notorious telemetry process, Windows 10 build 17093 also brings better Bluetooth device pairing, improved graphics settings for multi-GPU systems, and more. As revealed in a detailed blog post by Microsoft's Dona Sarkar and Brandon LeBlanc, the Windows 10 build 17093 became available for Fast Ring PC testers yesterday. This new preview build continues what the previous preview build (labeled 17083) started with the inclusion of the Diagnostic Data Viewer tool. 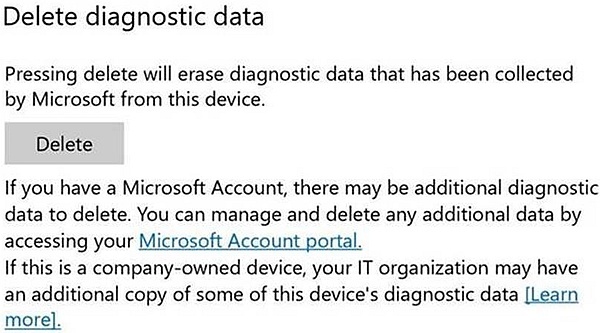 The build 17093 now finally allows its users to delete the Windows Diagnostic Data collected by Microsoft in a very direct manner: in Settings > Privacy > Diagnostics & feedback, a Delete button has been added. In addition to the above, those on Windows 10 S can use Microsoft's Authenticator App to setup their access without having to type in a password anymore. Wait, there's even more: Microsoft Edge gets a new "clutter-free printing" option in the Print dialog, while the Windows Subsystem for Linux (WSL) now allows socket connections between Linux processes on WSL and Windows native processes. At last, those who are not eager to test preview builds should not be sad. After all, the first Redstone 5 test builds are expected to drop by pretty soon, so this means that Windows 10 Redstone 4 is now pretty close. Since it is supposed to hit the market as the "Spring Update," we only need to wait for its accurate release date to be confirmed by Microsoft.